It seems confusing that a child sitting quietly in a car is required by law to have a seat belt on, while it's perfectly legal for a rowdy group of kids to sit unrestrained on a school bus in the very next lane. But multiple factors at work in the U.S. today allow for this situation to exist. 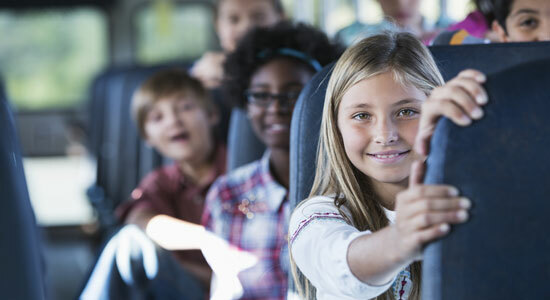 Accident rates, installation costs, and children's willingness to use safety belts all contribute to why most public school students don't wear seat belts on the bus…and why they probably won't be buckling up any time soon. 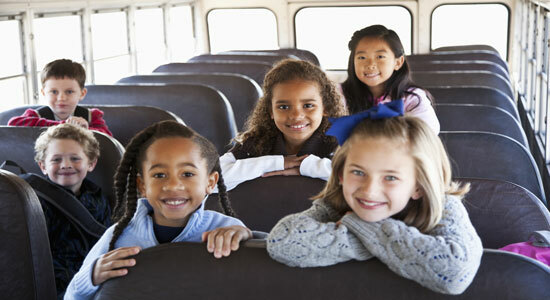 The majority of U.S. school buses do not have seat belts or other safety restraints. 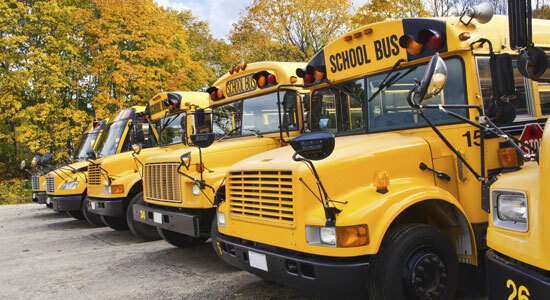 Only six states require that the large, standard long yellow school buses, which comprise roughly 80% of the nation's fleet, be equipped with seat belts. Federal law requires seat belts in buses under 10,000 pounds, but these smaller, 6- to 12-seater buses, only make up a small portion of the public school buses in use. What's the reason for this discrepancy? One of the main reasons is sheer size. Smaller school buses are required to have seat belts while larger buses are not because in an accident, a small bus would fare similarly to a passenger vehicle. These vehicles have significantly lower weights and centers of gravity than larger buses and can suffer more damage in a collision. 1. The big, yellow school bus is simply that—big. A 38 ft., 84-passenger school bus filled close to capacity with students can weigh in at nearly 40,000 pounds. The average passenger vehicle on the road today weighs about 4,000 pounds. The biggest risk posed to buses is the threat of a collision with another vehicle, but since a bus probably weighs more than 10 times what most nearby vehicles weigh, damage in a collision will likely be more significant to the smaller vehicle. 2. School buses are remarkably safe. 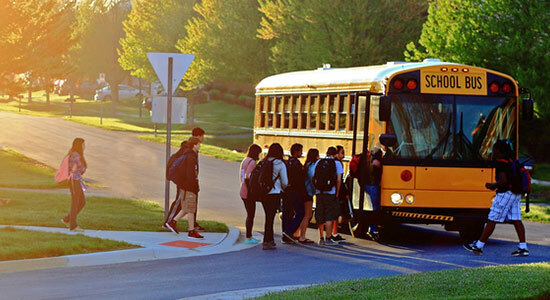 Study after study has shown that school buses are the safest form of all ground transportation, and the National Safety Council concluded that kids are 40 times safer taking the bus to school than being driven in the family car. The majority of school-bus related accidents do not take place inside of the school bus. Most children are injured walking to the bus stop, or after getting off of the school bus due to some environmental cause. If a school bus with students on board does get in to a collision, it is rare that children on board are injured as they are fairly protected sitting high above other vehicles in the confines of the bus. 3. The cost of installing seat belts would be astronomical. When considering school buses' extremely low accident rates versus the cost of installing seat belts on these vehicles, the costs far exceed the benefits. A University of Alabama study found that installing seat belts can cost up to $15,000 per school bus while having little to no impact on safety. If seat belts on school buses were phased in over the next 10 years, this would cost each state a minimum of $117 million dollars in taxpayer's money. 4. School bus seats are specifically engineered to prevent injuries. Just because school buses don't have seat belts does not mean that these vehicles are built without safety measures. 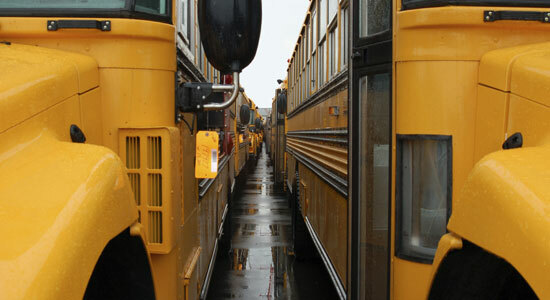 School buses rely on a "passive restraint system" which keeps passengers confined to a small, protected space without them having to manually perform a safety-related task (for instance, buckling a seat belt). Modern-day school bus seats are engineered to encourage compartmentalization of passengers. Bus seats are spaced closely together, and are covered with 4-inches of thick, safety foam to form a protective bubble around students. In an accident, this safety foam will absorb most of the impact, and the seats' tall height is meant to prevent passengers from being projected through the air. 5. Children likely wouldn't use seat belts, or would use them incorrectly. Even if all school buses were equipped with seat belts, the likelihood of children choosing to use the restraints correctly, if at all, is very slim. It can be hard enough to make sure one or two children in the back seat of your car haven't decided to unbuckle their safety belt mid-drive, but imagine how hard it would be to monitor 70 – 80 children. A recent report from Texas, where the state legislature was considering enacting stricter school bus seat belt laws, found that relying on bus drivers to monitor seat belt compliance would be "almost impossible." The report advocated that the bus driver's task should be to focus on driving, not on monitoring seat belts. Seat belts can make a world of difference in a car accident, but when it comes to school buses, there seem to be other, more efficient methods of keeping kids safe on their trips to school. The best way to prevent school-bus related injuries is to make sure your kids know the right and the wrong ways to act on and around the school bus. As the new school year begins, visit our other resources on School Bus Safety, and share this information with your children so they can have their best year yet. Source: “Why your child's school bus has no seat belts.” Today.com. August 24, 2015.